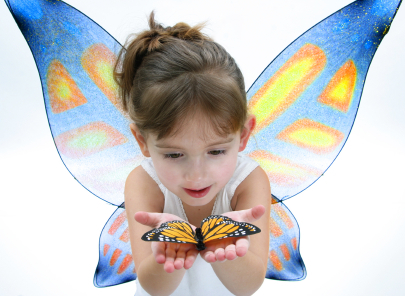 Kindergarten & Preschool for Parents & Teachers: Kindergarten Readiness - Enroll or Wait? "Until very recently, my daughter could still wear size 18-24 month clothes. She'll turn four this summer, so you can imagine how small she is for her age. Ive rarely had to buy new clothes for her. Since I'm a bit of a cheapskate, this was a major bonus for me, but the novelty has recently worn off. Because of her summer birthday, I am realizing that she'll either be the youngest in her grade, or the oldest. It was adorable to have such a petite girl when she was a toddler, but now that we're beginning to think about enrolling in Kindergarten, I'm starting to wonder if I shouldn't hold her back to give her time to catch up in size to the other kids. On the other hand, she's smart. How smart? Well, every parent thinks their child is very intelligent, but she could sing the alphabet song at age two. I'm not a teaching expert, so maybe that's no big deal, but her little brother sure can't sing the alphabet song and we had his second birthday last week. I've asked around for advice, and of course, everyone has differing opinions.Who should I listen to?" Are you struggling with the difficult decision to send your child to kindergarten - or to wait and “red-shirt” them? As a former Kindergarten teacher, my advice is to enroll your child when they are of the legal age unless you feel strongly that they are not emotionally ready and have been advised by their pediatrician and/or their day care personnel to consider holding them back. The Mayo Clinic has a link for Developmental Milestones for Preschoolers. If your child needs Special Education services, it is best to have an early diagnosis and the services begin as soon as possible. The federal government has mandated that every child receive free testing if a parent requests it and free special education services for those who qualify. Call your local school district if you have concerns. Even speech therapy can begin before kindergarten and be of great benefit. Here is a FREE on-line 5 minute quiz to give you an idea of your child’s readiness: Is Your Child Ready? It is important to note that in the Fast Response Survey System (FRSS) Kindergarten Teacher Survey on Student Readiness, teachers reported that the most important signs of school readiness are being able to communicate needs and wants and being curious and enthusiastic about trying new activities. Counting and letter recognition were scored less as being an indicator of readiness. The gap is widened between economically disadvantaged children (parents can't afford day-care) and their peers who were held back - which results in a wider range of academic levels in the classroom. Is it Best to Delay Enrollment? According to the Mayo Clinic: “Some parents choose to delay a child's entrance into kindergarten, believing that a child can gain an advantage in academics, athletics or social settings by being older than average for his or her grade. This is also common among boys who have birthdays near the cutoff date—with parents believing their child needs more time to mature. However, research suggests that children who are old enough for kindergarten but postpone enrollment for one year don't perform any better than children who enter at the usual age—particularly if the child remains in an environment where readiness wasn't being fostered. 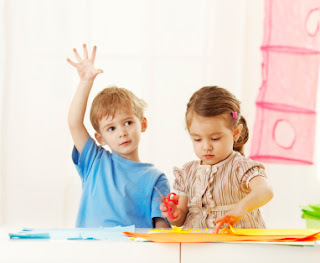 In addition, other studies show that a child who is old for his or her grade is at higher risk of behavior problems during adolescence.” For more information, click Early Childhood Research and Practice and The National Association of Early Childhood Specialists in State Departments of Education. It is very difficult to leave your child in the care of someone else, including qualified teachers. Our school had a Boo Hoo Breakfast on the first day of school giving parents an opportunity to meet and support each other. For a glimpse into a kindergarten classroom, click on my book (a number 1 Bestseller in Pre/K on Amazon): Kindergarten: Tattle-Tales, Tools, Tactics, Triumphs and Tasty Treats for Teachers and Parents. unless you spread your wings and try. For a glimpse into Kindergarten, click on Kindergarten: Tattle-Tales, Tools, Tactics, Triumphs and Tasty Treats for Teachers and Parents. Do you need playful learning activities for your preschooler while saving your sanity? Katie NorrisKatie and I teamed up to write this book with a mom's dilemmas and a teacher's solutions: The Happy Mommy Handbook: The Ultimate How-to Guide on Keeping Your Toddlers and Preschoolers Busy, Out of Trouble and Motivated to Learn. Both are bestsellers and also available on Barnes & Noble and Kobo. Whenever I sign up for a linky, I always hope I will connect with someone really special. Hurray!!! That is what happened today! I thank you for taking a look at my parent/teacher blog: Positive Parental Participation and leaving a comment. So, of course, I came to see who you are and discovered your post...which is one of the best "should I send my child to kindergarten" ones I have ever seen! I had that same decision to make with my younger son...he was a December baby, and the cut-off, in those days, was December 31. He was ready in some ways...but not in others...and you are so right, if you ask 100 people/experts, you will get 100 different answers. We did send him...he is 37 now and a happily married, successful professional who is loving and positive...but there were many times that I questioned our decision. I will tweet and spread the word about your post (and book)...I planned on doing a post on School Readiness later this week and will link your post to it if I may. So nice to meet you, Susan! Vivian - I visited your blog and your book looks amazing. Such a wonderful resource of children's books. Thank you so much for visiting and I look forward to working with you in the future. Visiting from the Bloggy Moms Blog Hop and it just so happens that I have a son starting K this fall. Your post was very interesting to me, esp. the guidelines! What a wonderful blog you have. Thank you for commenting. I hope your son has a fantastic kindergarten year! Your blog is wonderful. I'm following you. The Bloggy Mom's Blog Hop is great. Thank you so much for commenting. Thanks for stopping by. Your Boredom Blockbuster ebook is wonderful. I hope you reach your goal for helping BGCA get enough school supplies. I don't really agree with the notion that day care is the best path for your children before kindergarten. The assumption that families should or would put their children in day care if they could afford it is a faulty assumption. I think most parents would love to not send their toddlers to day care, but they can't afford not to work. That aside, I love the article! Great information, very well supported. Great information Susan. I like how you listed some positives and negatives. Thank you for taking the time to link this post up. I agree with this advice. Although she is small, she should do fine with the other children. Female classmates of mine (born in August) have done great in school. Now if we were talking about a boy, my advice might be different... I personally feel that it's to her advantage to be the youngest. Practically she graduates from high school before she turns 18... she will be finished with her first year of college by 19 (so if she wants a head start in a career, this is a great advantage!) Definitely enroll her into Kindergarten and see how it goes. If there are any problems, you can always reconsider later. Good luck. But I've pretty much decided to have him go as a 6 year old, not because of the effect on him at the kindergarten level, but because of the effect on him when he's in jr. high, high school, etc. I'm hoping that he'll be more mature than his peers at that age and I think it would be better for him to be the oldest in his class instead of the youngest. However, I haven't thought to look up any research on it - just been talking to adults with summer birthdays. We will wait until the end of this year (first year of preschool) to decide for sure, but to help our decision, have you seen any research about how it affects them later in school? See the Science Daily link above. Thanks for visiting! Such an informative post. Thanks for sharing this post to us. 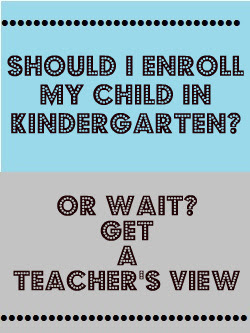 This will really help moms to decide whether or not enroll their kids in a preschool. Yes! I agree, reading this post adds more information especially for moms. Thanks for sharing and keep posting. I agree with the comments above. This is really informative about preschool. Thanks for sharing and have a happy new year! I'm a mom of a 5 y/o daughter that started kindergarten this school year. She was born in June and is the youngest of her class. She is reading at a 1st grade almost 2nd grade level and is going to the 1st grade for reading. I had thought about holding her back a year so that she could be older boy I would have done her a disservice!! Many parents are considering holding their child back because they want them to be leaders - or they aren't reading - or they think they are immature. Many of the children who are held back would have made great progress by entering kindergarten when of age. It can be a very difficult decision to make - but I encourage parents to enroll their child. This is especially helpful if a child will need special needs services because the process to qualify can take a very long time. Thank you for your comment. As a teacher myself, I would advise parents to talk with the potential kindergarten teacher about their expectations and definitions of kindergarten readiness. Every school system is different. On a personal note, as a mom of a daughter whose birthday is at the end of August, I regret redshirting her.I didn't see it at first because she's academically ready and has been doing well. But now she's in 5th grade and the youngest in her class, she is struggling socially. Another thing to think about, is that schools are not the same as they used to be. Demands on academics and social pressure are more tougher than ever. Do your child a favor, give him or her the gift of an extra year to be a kid before throwing them into the jaws of the educational system. A late summer birthday can justify reshirting, especially with boys. Immaturity can be the determining factor but I don't think academics should be. Yes, socialization can take longer for the younger in the class but many blossom when given the opportunity to develop socialization skills. I can understand your concern though certainly. Thank you for commenting. I am at this turning point for my son. He is 4 turning 5 on July 30th. At testing today they said he is academically ready but they feel he could benefit from another year in preschool socially, but he has already been in preschool two years. I think he will benefit from entering into Kindergarten and am afraid he will be bored (or already is) with preschool. It's hard to have someone tell you they don't think your child is emotionally ready, but I know him and I think Kindergarten is going to be a better choice than another year of preschool. I am at this turning point for my son. We were at screening today and they said he is academically ready but feel he would benefit from another year of preschool socially. I understand their reasoning and wanting him to develop his social skills, but I also feel he can mature as the Kindergarten year progresses. It is hard for someone to tell you what they honestly think of your child. For me I think I am going to send him to Kindergarten and see how he progresses. I fear he will get (or already is) bored with preschool, and I want to see him grow. I just came across this on pinterest and wanted to say thank you! My parents and I are constantly butting heads about my son starting kindergarten this fall. He will be 5 in July and I say he's ready they say he's not. He is very intelligent and I feel that if I don't enroll him, I'll be holding him back. He only went to daycare for a few months so he hasn't been socialized that much and he has this thing where he can't stand watching other people eat, but I think talking to his teacher should help work out some sort of plan for that..any advice? I am a young mother and my oldest child is getting to the age where it is time to decide if I should enroll her in preschool. Then there is also the question of what school. It is certainly a difficult decision for parents to make.